We love living in Bluffton, S.C. – it’s located right along the coast near Hilton Head and along the May River. Our studios are right along the May River, a near perfect inspiration for our art. Recently, travel expert Eric Hastings to tour our hometown for brief tour. Check it out. And if you’re ever in Hilton Head, send us an email and step over to Bluffton and say hello. We’ll take you on a tour of our hometown, our studios and the community of artists thriving here. The Secret to Turning Consumers Green? Guilt. Today, The Wall Street Journal published an interesting feature, “The Secret to Turning Customers Green.” Normally we pass over articles like this because they all tend to say the same thing – appeal to our sense of responsibility to the planet – but WSJ looked at a couple of programs in Washington, D.C. that are successful using a new tactic: guilt. From the article, the case studies, and the research, it seems that a more powerful motivator if other people see our behavior. While we’re not adding guilt to our marketing strategy, we certainly hope you’ll be seeing other people with BottlesUp glass water bottles and be motivated to make the same choice. Infographic: 2010 Water Consumption in the U.S. I know we like to share infographics, we find their ability to share our consumption in interesting ways helps us all better understand the impact of our plastic water bottle habit. 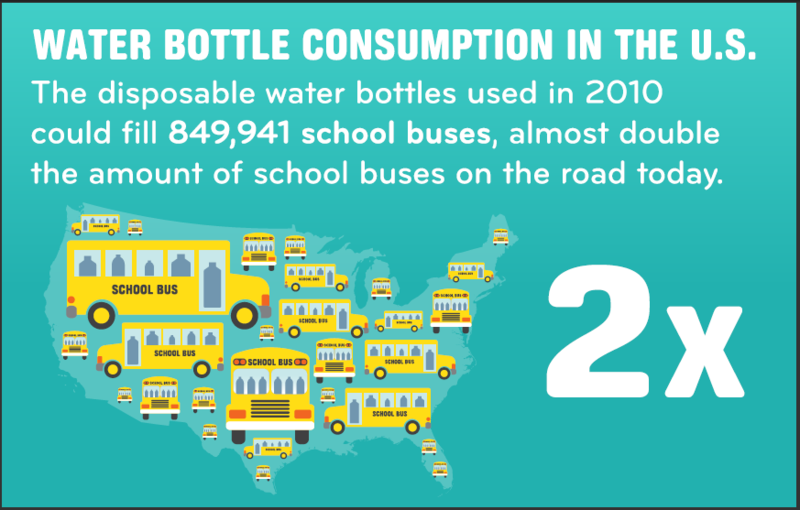 Check out this one below from Do The Reuse Challenge that equates our U.S. water bottle consumption to fueling school buses. No matter how you look at it, we’re way over-consuming plastic. It’s why we’re focused on giving you a better and more beautiful option. In 2005, now 5 years ago, TED awarded renowned photographer Edward Burtynsky its annual TED Prize. We’ve heard of Burtynsky’s work and his passion to document our human impact on our world. His riveting, and at times near horrific, landscape images captivated us and clearly the people at TED. His video below, which includes his images, is a compelling message for all of us to move towards sustainability. What do you think? Have you found images that changed your own behavior? Send us a link.